In the midst of the Gunnison National Forest an hour-and-a-half from Crested Butte, Waunita Hot Springs Ranch is a place to relax, recharge and enjoy the attractive area around you. 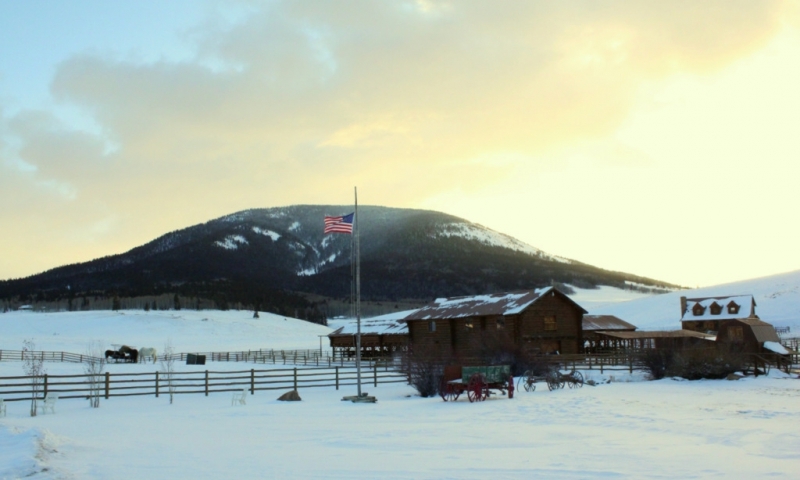 Waunita Hot Springs is a privately owned dude ranch an hour-and-a-half from Crested Butte. In the summer, week-long adventures at Waunita Hot Springs include horserides, evening entertainment, hiking, camping, a naturally heated pool and spa and other fun activities. During the winter, Waunita Hot Springs provides rooms, meals, a heated pool and spa. In the off-season, Waunita Hot Springs operates as a Bed & Breakfast. For more information, contact Waunita Hot Spring at 970-641-1266. Waunita Hot Springs Ranch is a private dude ranch located high in the mountains near Crested Butte, surrounded by National Forest Land and the natural hot springs (almost 100 different springs) in the surrounding Waunita Valley. Privately owned, the ranch consists of two large lodges, a large rec room, two resident homes, a barn and a corral. All around the ranch, forests and mountains provide places to run, hike, ride and enjoy the outdoors. Hot Springs: The heated pool and spa at Waunita Hot Springs has plenty of room for swimming, soaking, relaxing and more. If you’re in need of a bit more pampering, sign yourself up for a massage. Day Rates available - call for pricing. Horseback Riding: Horseback Riding is one of the most popular activities at Waunita Hot Springs. Their week-long program matches you with a horse, provides instruction and leads you on trail rides through forests and high above treeline, where you’ll be treated to a view of the surrounding valleys and peaks. Fishing: Fishing is another popular pastime at Waunita Hot Springs. Nearby Blue Mesa and the Gunnison River provide Gold Medal trout fishing, and a number of small lakes, river and streams are all filled with trout and salmon. Waunita Hot Springs even has its own stocked beginner pond, where you can perfect your cast and help your kids catch their first trout. Whitewater Rafting: If you need some more adrenalin, the Taylor and Gunnison Rivers have exciting whitewater runs, as well as mellower scenic floats. Western Activities: If you’ve still got some party left in you after a big day of riding, hiking and playing in Waunita Valley, you’ll find evening activities that includes hayrides, Western music shows and square dancing that will keep you entertained as long as you can keep your eyes open. Star Gazing: Enjoy the night sky and incredible star watching with a night out camping. Guests at Waunita Hot Springs can stay in private rooms within the Main Lodge, where many activities and most meals occur, or in the Hillside Lodge, which has larger, multi-roomed family-style units. Waunita Hot Springs is open year-round, although the services they offer change a bit with the seasons. As long as there is availability, non-lodging visitors are welcome to enjoy the pool area for a day rate. Call ahead of time for availability and pricing. Summer Packages: In the summer, Waunita Hot Springs is a week-long ranch-style vacation getaway, complete with horseback riding, evening entertainment, a heated pool and spa and more. Winter Packages: In the winter, Waunita Hot Springs only provides rooms, meals and the heated pool and spa. Off Season Packages: In the off-season (spring and fall), Waunita Hot Springs operates as a Bed & Breakfast. For more information, contact Waunita Hot Spring at 970-641-1266 or info@waunita.com.